This will be an online/absentee only auction. There will be no live auction. Place your bids online or come to preview & place absentee bids. You may also call your bids in. Have your items shipped or pickup the week of Monday April 15th at 5437 Bossler Rd, Elizabethtown, PA 17022. Sale to include antiques, cast iron wall hangers, cast iron skillets, cast iron door stops, cast iron tea kettles, vintage rolling pins, Daisey bb guns, snow globes, AVON ruby red cape cod glassware, milk glass, depression glass, hens on nests, Ball & Atlas mason jars, glass drink dispenser, salt & pepper shaker sets, teapots, vintage hats, antique telephone, apothecary weigh set, fire hydrant lamp, jug crocks, stoneware crocks, Hess trucks, toy banks, marbles, vintage toys, Barbies, model cars, matchbox cars, cookies jars, Cat's Meow wooden displays, Nutcrackers, M&M collectibles, galvanized buckets, fluid lamps, glass figurines, crystal figurines, beer steins, music boxes, milk bottles, advertising, vintage bells, Stangl pottery, antique plows, feed trough, green metal swing, iron plant stand, & more. 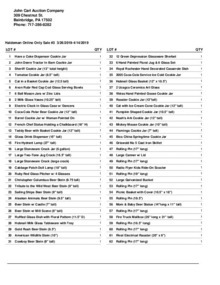 Scroll below pictures to view a PDF of the full catalog or click on green online bidding button to view the online catalog with pictures. Preview is Friday April 12th 1:00 till 6:00 at 5437 Bossler Rd. Elizabethtown, PA 17022. Have your items shipped or pick them up Monday April 15th from 9:00 to 6:00 or Tuesday April 16th from 9:00 to 6:00. If those times don't work, please call 717-618-9727 to schedule a pickup time. Please pick up your items as soon as you can. If you don't pick up your items by Friday April 19th, we will ship your items at your cost & charge your card on file. Pickup items at 5437 Bossler Rd. Elizabethtown, Pa 17022.